This is a great game to help your family learn to cooperate, problem solve, work together as a team and be patient with others. All you need is a hula hoop. Because adults are taller than kids, it works really well to have parents play on their knees. Then everyone is closer in height. Players stand in a circle around the hula-hoop. Each player must place two straight fingers (one on each hand) on the hula-hoop. Supporting the hula-hoop. The group must then lower the hula-hoop from waist-level to the ground. Both fingers much remain completely straight and must maintain contact with the hula-hoop at all times. 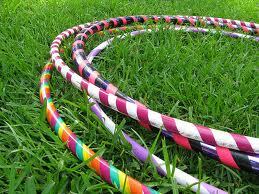 If anyone's finger(s) come off the hula-hoop or bend at any time the group must start over. I know this sounds simple, but just wait. It is not as easy at it looks.